We left ‘’the bay area’’ towards Napa Valley and Wine Country! We only had one stop: the Mumm Napa Winery. 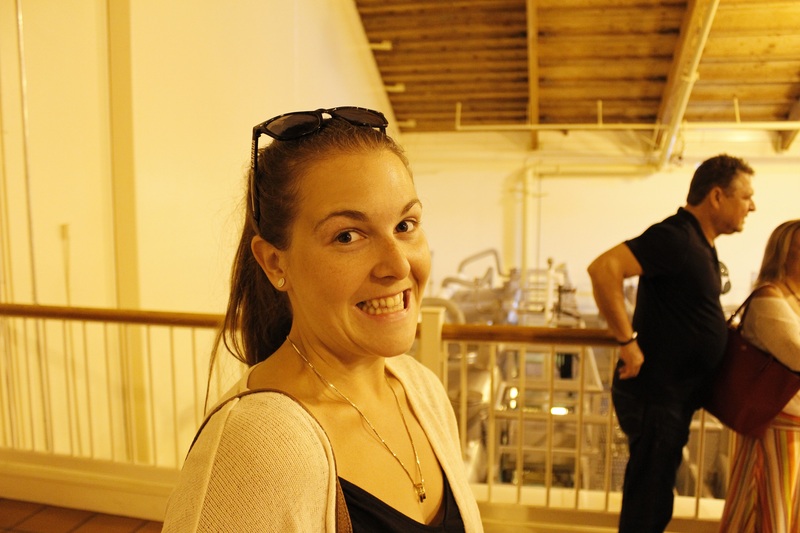 Adry is a big buff of this sparkling wine so we decided to stop to do the winery visit. 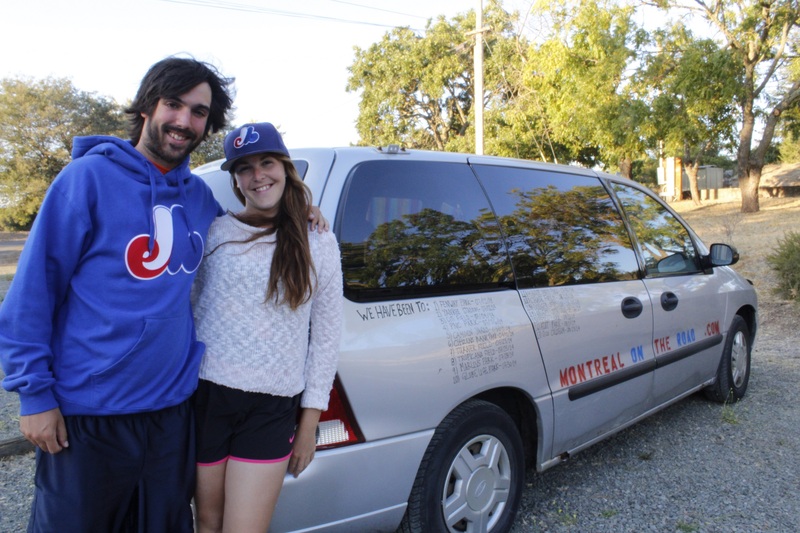 We visited the winery (8 Quebecers out of 10 visitors in our tour!) with, obviously, the wine tasting along the way. 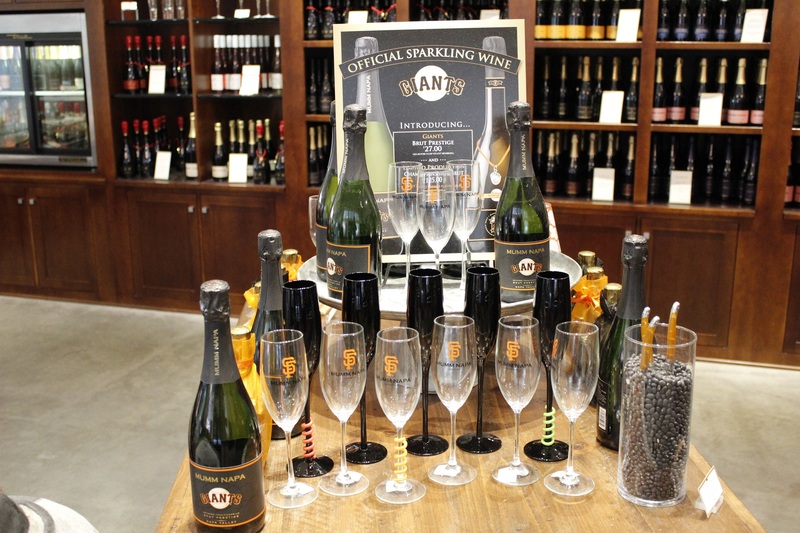 We learned a lot of things about the creation of sparkling wine. By the way, the treaty that gives the name ‘’champagne’’ only to wines produced in this region of France was never signed by the United States since they were in the prohibition era at this moment. The American producers will still honor the treaty as a sign of respect for the French producers. We took a few days off in a campground not too far from the winery to (finally) get a good shower! We also took the time to cook ourselves some good meals with fresh ingredients! Something that we have rarely done in the past 2 months! We left Napa Valley the day before the earthquake shook up California! 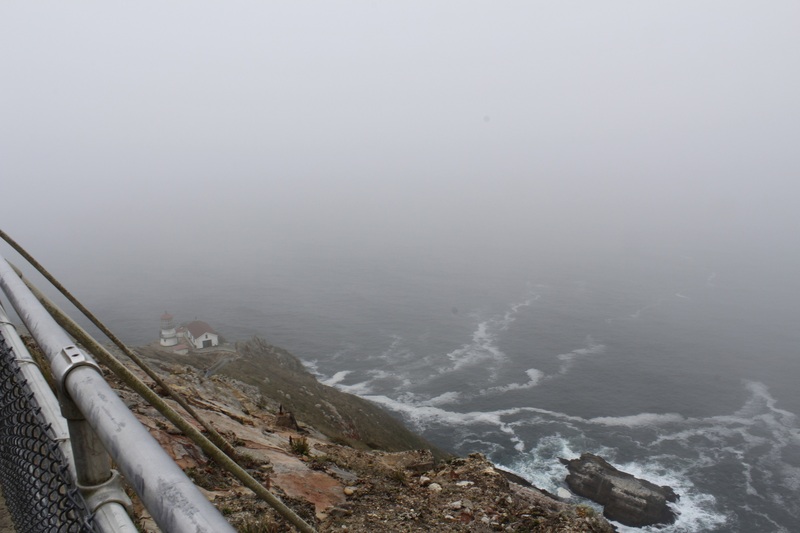 We stopped by point Reyes: a national park that is located near the Pacific Ocean. 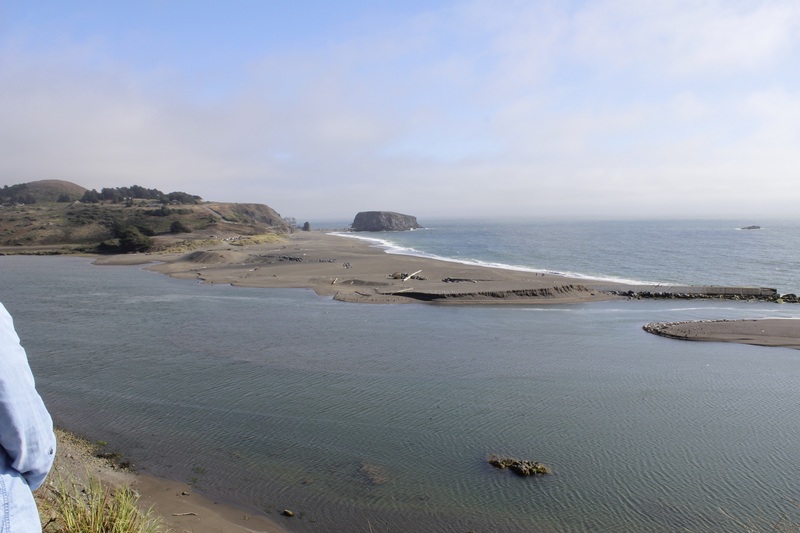 In this national park, we got to visit a lighthouse that guided boat along the Californian coastline for many years. 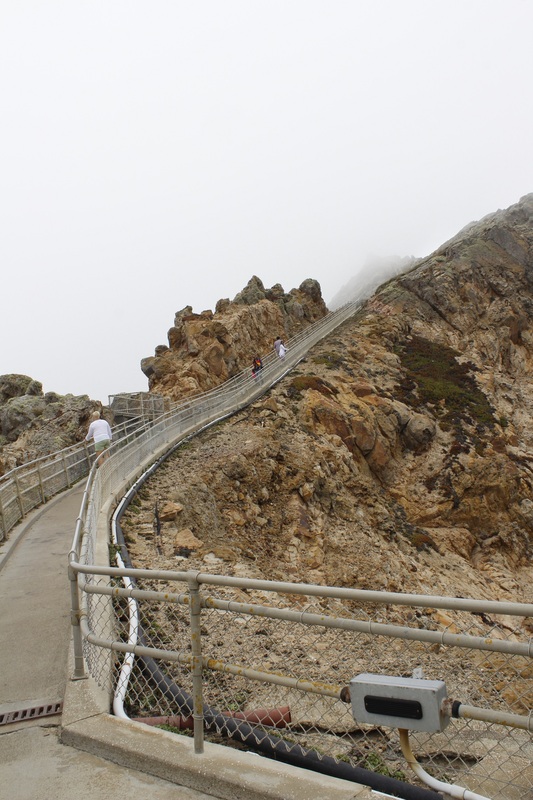 Funny thing, to go to the lighthouse, you have to go down 300 stairs! Coming back up is kind of tricky! We were planning to visit the Oyster shack that is located in the park but, sadly, it was closed down by the government a few weeks before our visit. We still got to see the employees gathering the oysters but we couldn’t buy them over there. We took the famous road number 1 along the Pacific Ocean. 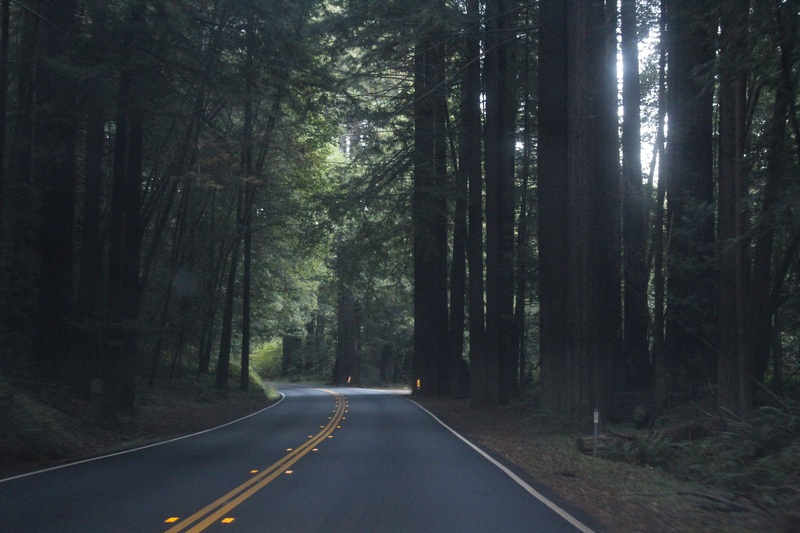 We had a great scenic drive but we have to say that there are a lot of turns… I had trouble getting concentration to write my last report. Also, we are not driving too fast on this road (Californians with Prius love to take their time on the road and they always look like they are totally lost!). We judged that is was better for our schedule to cut west and drive towards the interstate. We stopped at a Wal-Mart to sleep and big surprise: for once we were not alone sleeping in the parking lot: many campers and RV were out there. It always gives us a little feeling of security when we are not alone! 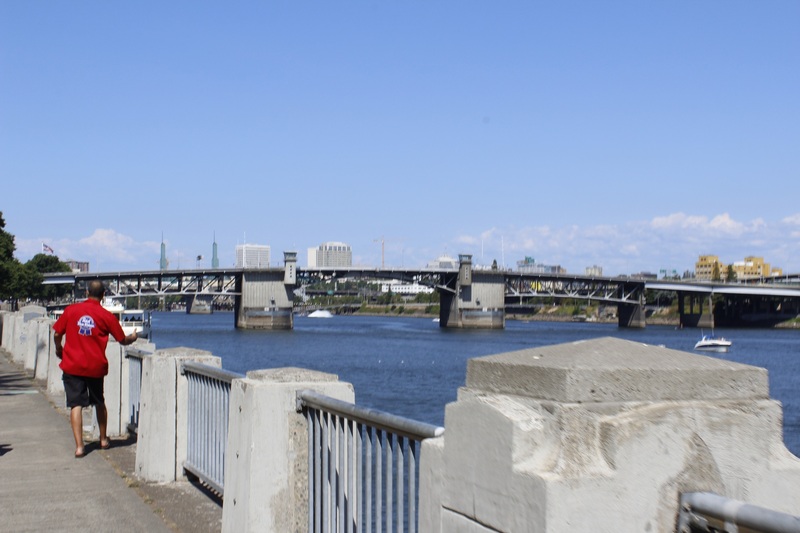 Next day, we took the afternoon to visit Portland, in Oregon. Little deception for us: we have been toon there were a lot of breweries to visit. It’s not actually brewery visits, it’s mostly pub crawls so no visit of facilities. Saturday was market day in Portland so we enjoyed just walking around the market to see all the weird stuff they were selling along the water front! 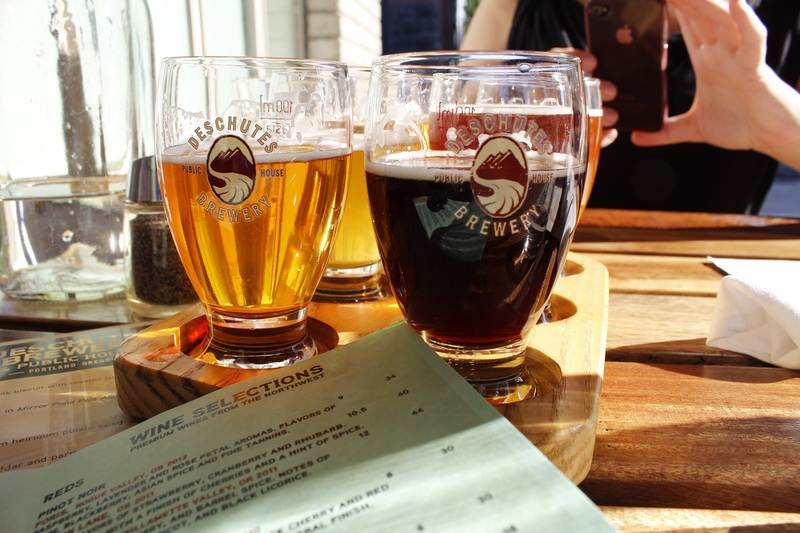 We still decided to stop by one of the most popular microbreweries of the city: DesChutes. The price of the beer was good and they were offering different tasting mix so we could try their beers. We left to Portland heading north towards Emerald city: Seattle! We arrived early in Seattle on Sunday to enjoy the most of our day. First Stop was the Pike place Market. 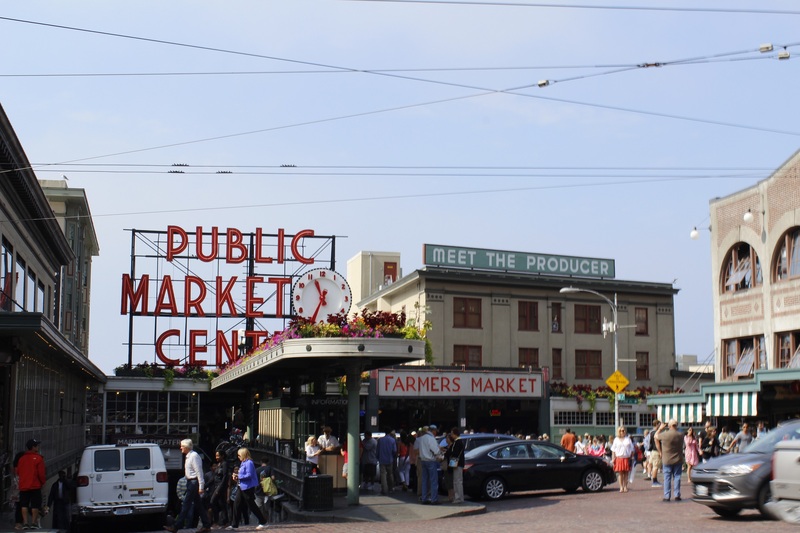 This public market located on the waterfront of Seattle was opened to the public in 1907. On street level, we mostly found fish market, butchers and fruits stands. Going to the lower levels (the market is built on a hill) we could see art crafts store, small restaurant, and the pike brewery. We stopped by to see the famous ‘’flying fish’’: at a fish stand, the employees are throwing at each other’s the huge salmons before handing them to the clients. There was a mass of tourists waiting for it to happen with their cameras on so we decided to skip since there are so many other things to see out there. 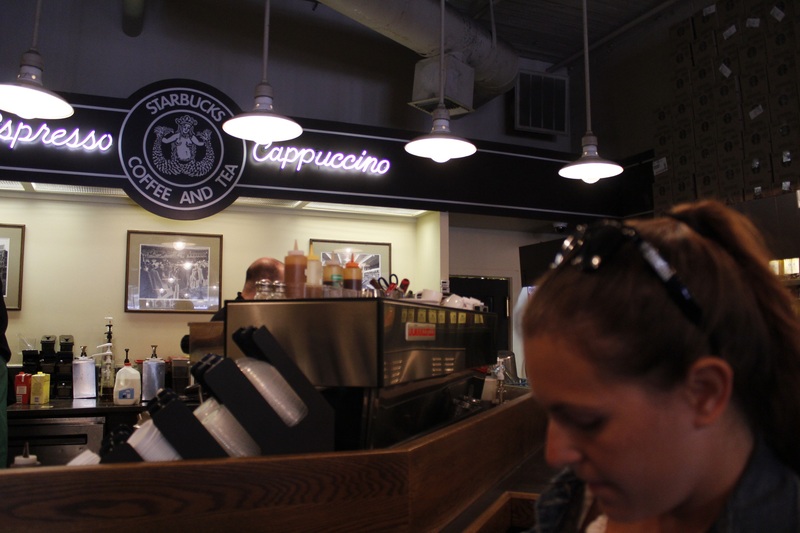 We had to stop by the first Starbucks coffee that opened in Seattle in 1971 and then moved to Pike market in 1977 before becoming an international success. 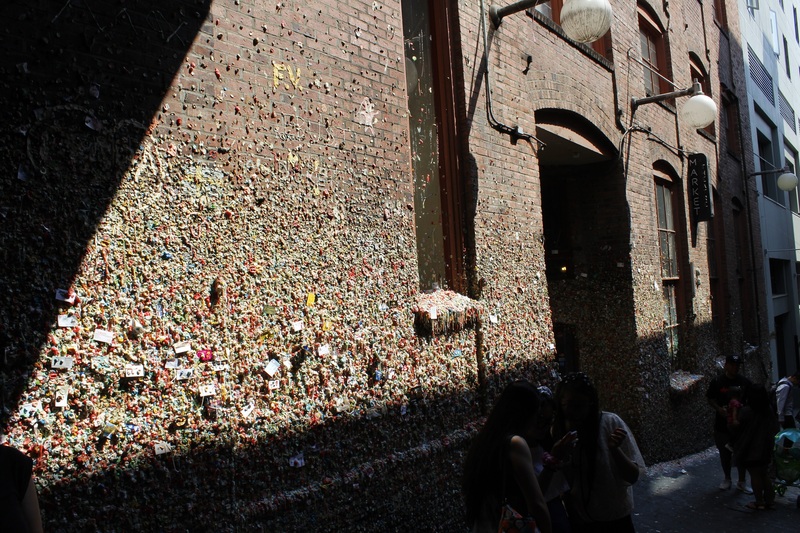 Our last stop was the famous Seattle Gum Wall: a wall was everyone put their old chewing gum! Nasty! We decided, for the rest of the day, to walk around Seattle. We found out that it was a great city to just walk around. Little history lesson: Seattle history is closely related to Alaska history and the gold rush: the prospectors were coming by boat to Seattle to buy material and sell gold. We could see many buildings relating this era. Another part of the city that we visited is the whole area surrounding the ‘’space needle’’. This tower is over 600 ft. high and was built for the 1963 universal exposition in Seattle. This exposition received over 10 million visitors and, rare thing for a universal exposition, even turned a profit! A lot of landmarks are still out there like the key arena and the monorail. 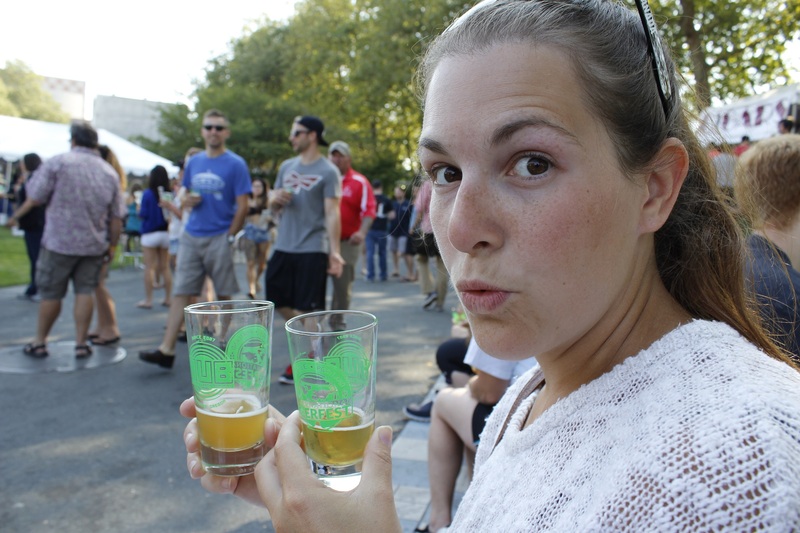 Lucky us, in this area, we ran into the last day of the Seattle international Beer fest! We tasted many good beers like Belgian beers and a grapefruit beer! The people of Seattle at the Beer Fest were nice and we both always enjoy those beer festival atmosphere! We were in luck in Seattle since we were staying with Jeason. He is the son of Annette whom had already hosted us in Tampa Bay. He was nice enough to offer us a bed for two nights in Seattle, which was breaking our 9 nights in a row of sleeping in the minivan! On the next day we had lunch with him and had a lot of great discussions about American politics and culture. We love to meet people during this trip to learn about all the culture surrounding this big country! After our good meal, we headed towards Safeco Field and the Mariners game. We walked toward the field on this beautiful afternoon in Seattle. Before getting to the ballpark, we walked by Century Link Field, home of the new Super Bowl Champions: the Seattle Seahawks. Everywhere in town we could see champion banners and people were wearing a lot of blue and green shirts\hats. 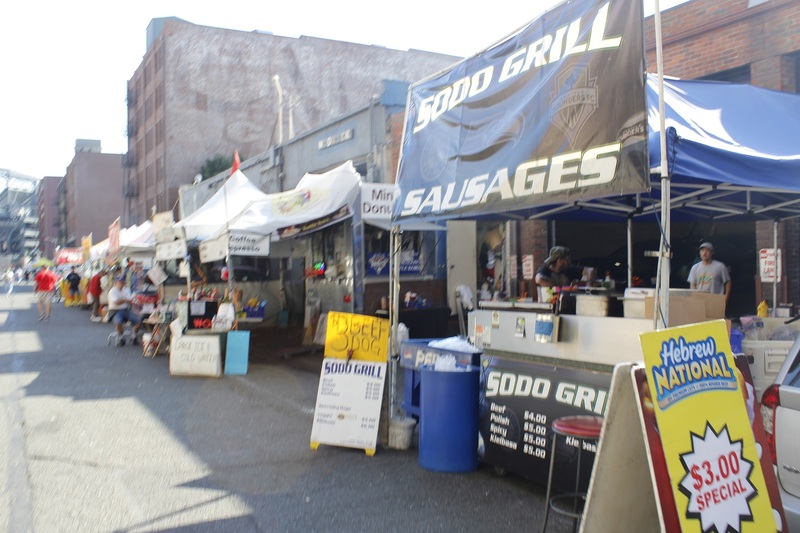 On the street that led us to the ballpark, we found street food vendors: hot-dogs, burgers, tacos, etc. Here’s an open letter to Montreal: Dear Montreal, we love that we can buy tiny portion of tartar salmon in our streets for 12$ of the smallest pulled pork sandwich in the world for 16$ but people like us would like to be able to buy more affordable food like those 2$ hot dogs! Why can’t we have both? I totally love salmon tartar but not when I’m going to a baseball game! We are a few of the cities that don’t allow this kind of street food. 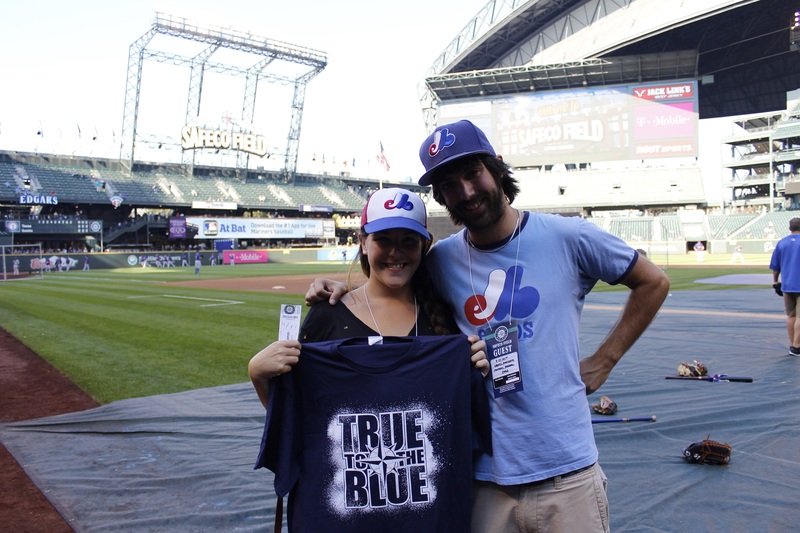 Before the game, we met up with Rebecca Hale: responsible for the public communications for the Seattle Mariners. She invited us to visit the ballpark before the game. First stop: we are heading to the field to watch the Mariners Batting practice! We had the chance to see the players hitting a few long balls! 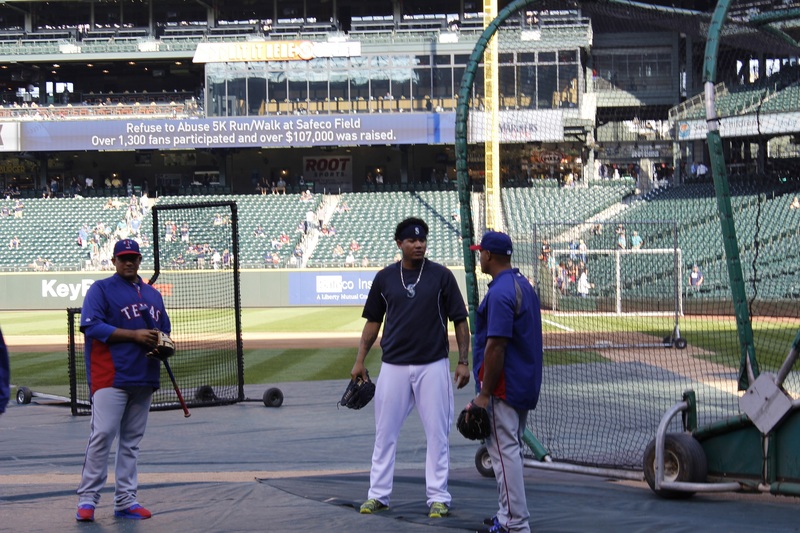 Also, we could see Felix Hernandez messing around with the Rangers players that were waiting their turn for batting practice. It’s such a nice feeling to be able to walk on a professional baseball field! 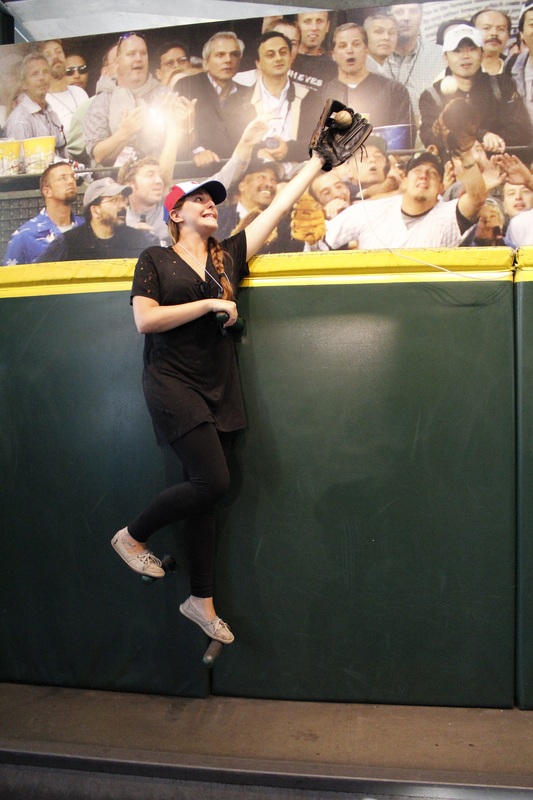 Rebecca stayed with us so we could do the whole ballpark tour with her. First she shows us the implication of artists in the ballpark (art at the park): a giant wind rose on the floor of the main concourse with baseballs and the signature of all the Mariners players on the opening day of the Safeco Field. It is the work of three local artists. We also saw a huge sculpture made from baseball bats in the main entrance. 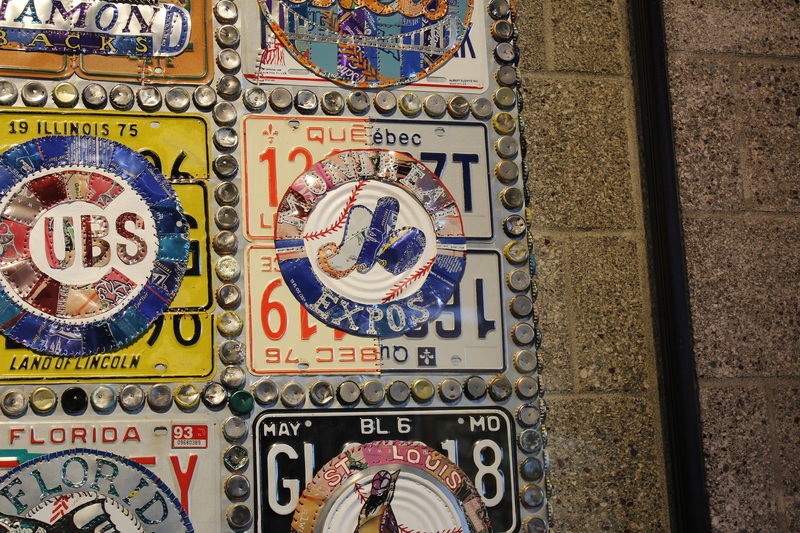 But the thing we loved the most was the art work representing every team made with license plates. The Expos one is still up there! Food talking, the Mariners opened their doors to the local producers. A lot of food choices are coming from the Seattle area: microbreweries beers, fish and chips and the famous garlic fries. We could smell garlic in the whole ballpark! The Safeco is a ballpark with a retractable roof. It doesn’t mean that it is a ballpark is totally closed when the roof is on. The roof is only acting as an umbrella over the field. It means it is still pretty cold at the ballpark early in the season when the roof is on! It is a big investment when you build a ballpark to add this kind of feature but, in Seattle, it was worth the price. 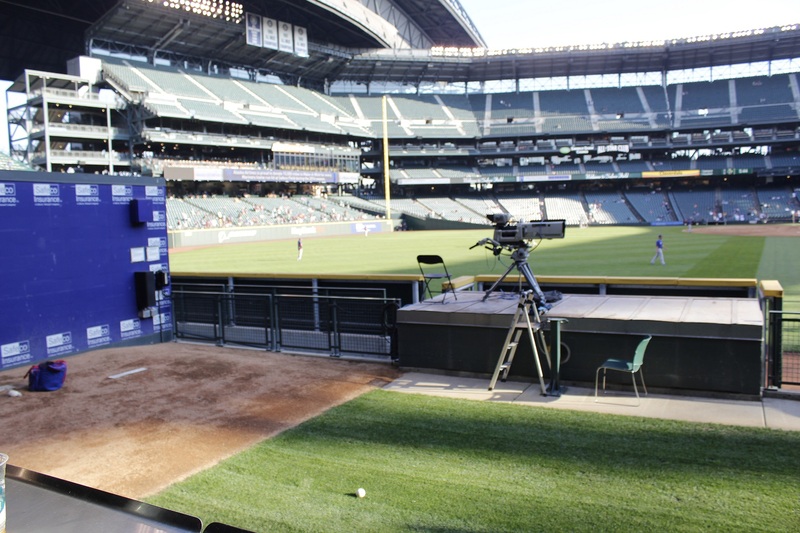 Also, we visited ‘’the Pen’’ a big area covering left field where the fans can stay during the whole game. From this zone, they can see the pitchers warming up in the bullpen from very close. In center field, there’s also a big area where people can stand out there during the game. This zone has a reputation to be a little more ‘’party’’. 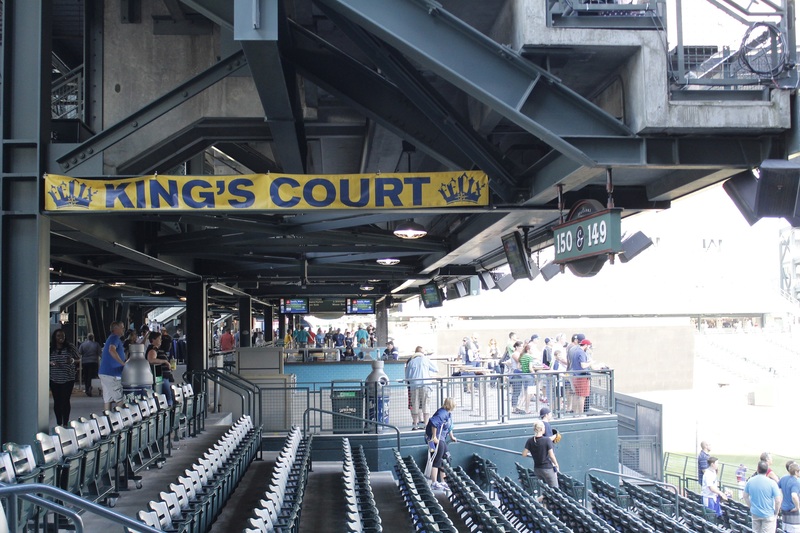 Not too far from there, we saw the famous King Felix Court: seating areas were people are all wearing yellow shirts and are waving ‘’K’’ signs when Felix Hernandez is pitching. Fans are really active in this area especially since the King pitched a no hitter in 2012. We didn’t forget to go by the Mariners hall of fame that is honoring the big name of this team: Martinez, Pinella, Johnson, etc. A part of the hall of fame is reserved for items from a private collection. The owner of this collection is creating different theme exposition every once in a while with jerseys, newspaper article, etc. 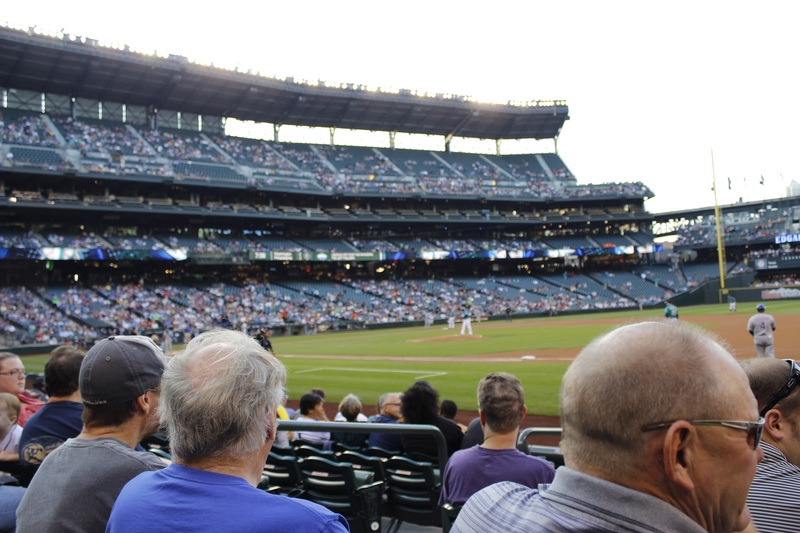 So many things to see at Safeco, we’ll probably forget a few! About the success of the Mariners, team that came to Seattle in 1977, it isn’t easy in general. Their first winning season was in 1991 and their first playoff appearance was in 1995. 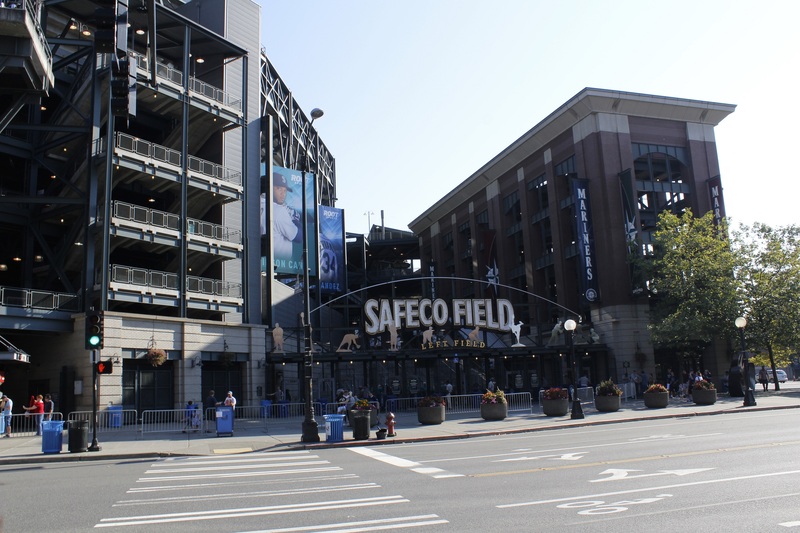 That year, the team was able to drag a lot of fans to their games and Rebecca told us that the success of the team that season was one of the main reasons that they built the new Safeco Field. In 2001, the Mariners finished the season with an American league record of 116 wins, tied with the 1906 Chicago Cubs. The last few years were also harsh for the team but this year they are in the run for the wild card spot in the tough AL west division. Rebecca also told us that the Seahawks Super Bowl win motived the Seattle people to come to the Mariners games this summer. Let’s say that the pressure is now on the baseball team! The Mariners fans have to drive, in average, 1 hour to come to the games. It’s one of the reasons that the weekday’s game has a lot less attendance out there. It is also one of the reasons for the investment of a roof: fans don’t have to worry of driving an hour to the game and get a rain check. We’ll talk a little bit later about our impressions of those fans. 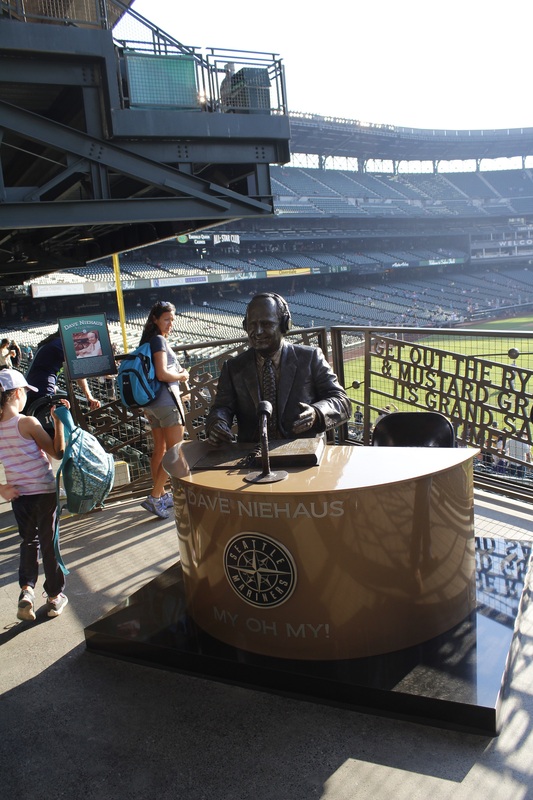 Last stop, Rebecca showed us the Statue of Dave Niehaus: ex play by play announcer for the Mariners. Sadly, he died in 2010 and it really saddens the fans of the team and the staff. 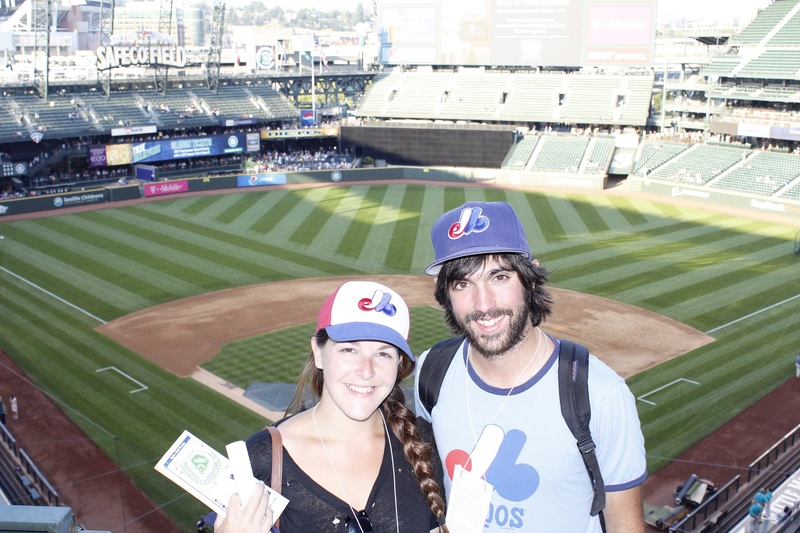 Thanks a lot to Rebecca for giving us a tour of Safeco field: coming from a team that already has lost a baseball team (the Seattle Pilots) it is a really classy move to recognize the project that we have in Montreal to get a new baseball team. 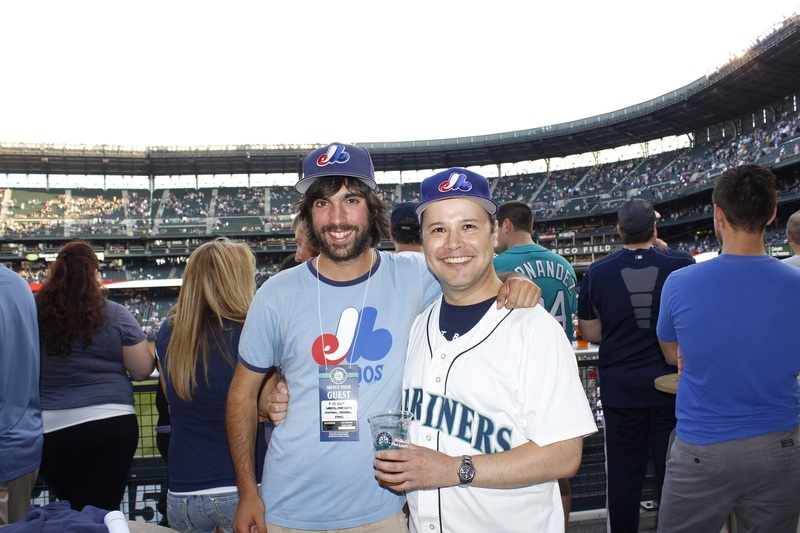 Before getting to our seats, we met with Michael: a Mariners fan that came to the game with his Mariners jersey and his Expos hat! He told us a little more about the Mariners and their fan base. The team is own by Nintendo and the last CEO showed very little interest in the team: he never showed up for games. A lot of fans didn’t like it and were asking for him to be replaced. The team is also known by fans not to be a big spender so a lot of them were surprise by the signature, at big price, of Robinson Cano. 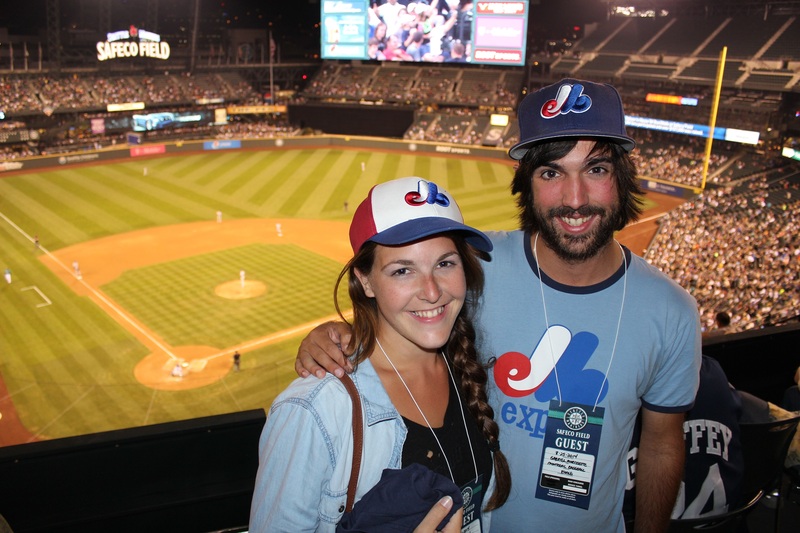 Michael also told us about the crowd when the team is playing against the Blue Jays: a lot of Canadians from British-Columbia are doing the trip towards Seattle to encourage the only (for the moment!) Canadian team in the MLB. He also described us the atmosphere in the ‘’party zone’’ during the game: a lot of people on their cellphones not showing interest with a beer in their hand and a lot of girls trying to catch the eye of the reliving pitchers in the bullpen! Thanks to Michael for meeting with us before the game and we wish he and the Mariners luck for the remaining of the season! 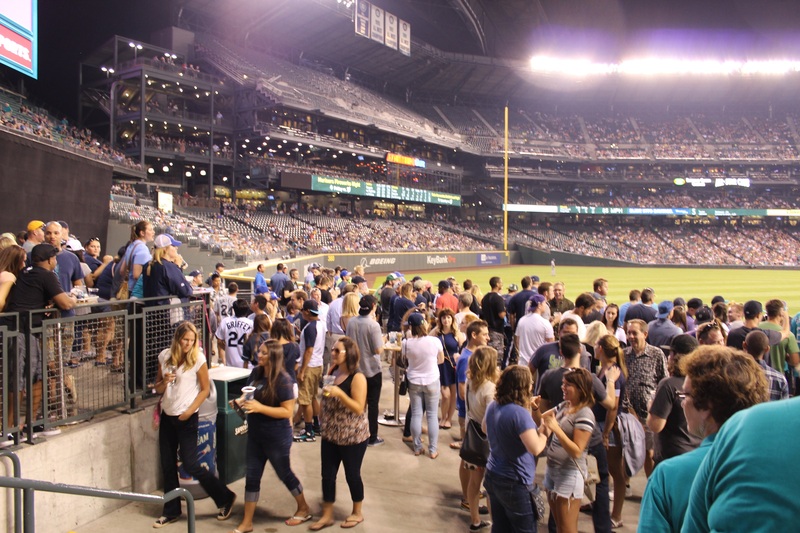 We realized that the Mariners fans are kind of calm during the game. It is kind of odd since that, football wise, Seattle has recently set a record for the loudest crowd in the NFL! After knowing some good years, the Mariners struggled in the 2000’s. The fan stayed away from the games but the arrival of exciting player like Felix Hernandez and Robinson Cano brought them back to the ballpark. We considered that Safeco field is a beautiful ballpark (cleanest toilet so far in the trip!). Many attractions so the fan can have fun before or during the game. The Mariners are kind of isolated up north from the other teams. Still, we were over 20,000 fans at the game on this Monday night. 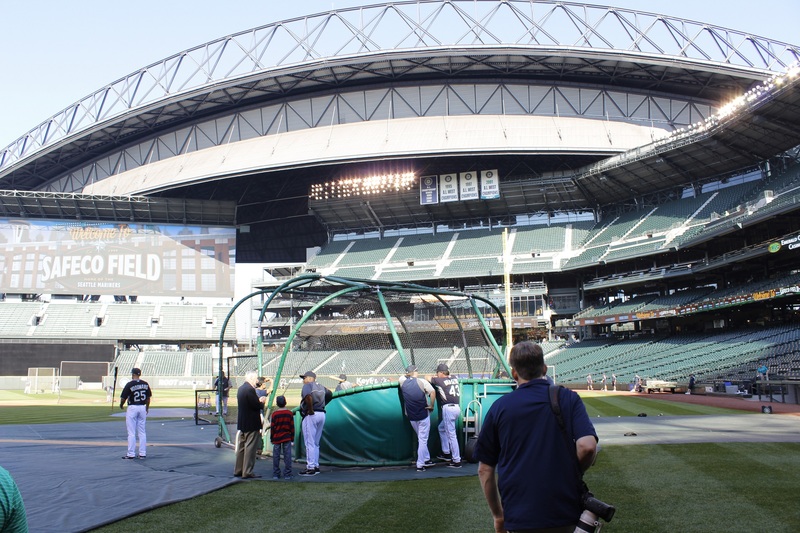 The Mariners are well managing their team and their ballpark. They are ready to put money in the team at the good moment. It’s really an interesting managing system. We wished them luck for the remaining of the season! We are leaving Seattle towards Denver but we have two stops on the way: Yellowstone Park and Salt Lake City! See Ya! P.S. 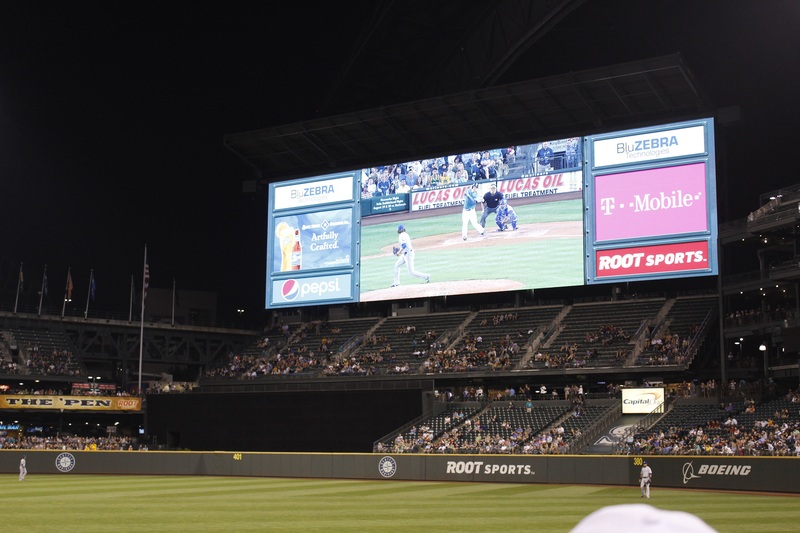 Did you know that the biggest video screen in the MLB is located at Safeco Field? It is 10 times bigger than the one they had before in Seattle!